Leisure World Seal Beach is a 55+ Retirement Community for the active minded, with plenty of leisure time to enjoy. Leisure World is nestled in the charming community of Seal Beach, Ca. Many younger and older seniors are still quite involved in their careers while enjoying the luxury of leisure activities on their free days leaving maintenance and gardening to the community professionals. Leisure World is a wonderful gated community with much to offer; a mild climate, wonderful ocean breezes, beautifully manicured grounds, friendly neighborhoods, companionship, activities, shopping and nearby quaint downtown Seal Beach, in famed Orange County, CA. Leisure World members enjoy golfing on our 9 hole golf course, swimming, water aerobics, relaxing in the jacuzzi, working out in the fully equipped gym. Resident's and their friends also enjoy evening concerts at the outside amphitheater, Saturday evening ballroom dances to mention a few of the many activities available. There are over 200 clubs, organizations and activities. Nearby is Main Street full of shops and restarurants as well as the Seal Beach Pier, Sunset Beach, Naples, Belmont Shores, Los Alamitos, Huntington Beach, Huntington Harbor, University Park Estates, and Rossmoor. Also available in Leisure World are opportunities for part-time employment as well as many opportunities for volunteering your services to help others. Access the Activities Tab to view a more complete list of activities available in this Leisure World resort-like community. You will find on the grounds of Leisure a U.S. post office, library, "pre-owned" book store, and health care center. Leisure World is a community of approximately 6500 residential units and just under 9,000 residents. There are two Leisure World Retirement communities in Orange County, California. The focus here is on the Seal Beach location. This location is just a stone’s throw away from the beautiful Southern California beaches of Seal Beach and Sunset Beach. Great shopping and restaurants and a great day enjoying quaint shops on Main Street is a favorite past time of the locals. Main Street leads to the Seal Beach Pier. Retirees can also go a bit further to the shops in Belmont Shores. Why Retire in Orange County? If you are not familiar with the area one of the key reasons people look to retire here is the great weather. Most days are sunny, and the local beaches provide a nice breeze during the warmer summer months. The quality of life here is unmatched any where. There are plenty of entertainment options from Disneyland to a stroll on the beach, to a day playing in the snow. Golf courses seem to be at every turn, and world class plays can be seen in one of several venues from the Orange County Performing Arts Center to world famous venues like the Dorothy Chandler Pavilion. To retire here in this region is to live the golden years at their best. Find out more about retiring in famed Leisure World by contacting the Sisters Real Estate team of Gloria and Kathy Gupton. Gloria Hadley and Kathy Gupton are Real Estate Partners and are often referred to as the “The Sisters" (yes, they really are sisters). 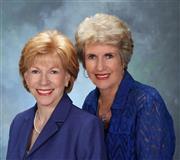 They are both Full Time Realtors and are happy to be affiliated with Prudential California Realty. Together over the past 15 years they have been involved in over 2800 listing and sales in the Leisure World Community. "We are service oriented and welcome any questions you may have. We also offer tours of Leisure World by appointment seven (7) days a week. You can reach us as follows." "Leisure World is a registered trademark owned by RRLH, Inc. Gloria Hadley, Kathy Gupton and www.liveinleisure.com are authorized by RRLH., Inc. to use the Leisure World service trademark.